Student Entrepreneur looking for Money? Founding a startup can be a financial burden when you’re doing it as a student. Thankfully, there are several resources available specifically for students to alleviate these costs. Jay Bensal and I compiled a list of some of these sources. We’d like for this list to be dynamic. If you know any resources we’ve missed, tweet at us so we can add it to this list! VentureWell Student Grants — Up to $25,000 for no equity. Applications accepted three times a year. RoughDraft Ventures — Up to $25,000 in the form of an uncapped convertible note (learn more about convertible notes here). Dorm Room Fund — On average, a $20,000 investment in the form of an uncapped convertible note. Lightspeed Summer Fellowship — $15,000/founder + $5,000/team for no equity. Accepted startups spend the summer working full-time from Lightspeed’s offices on Sand Hill Road. Summer @ Highland — $20,000 in the form of an uncapped convertible note. Accepted startups spend the summer working full-time in free office space provided by Highland Capital. 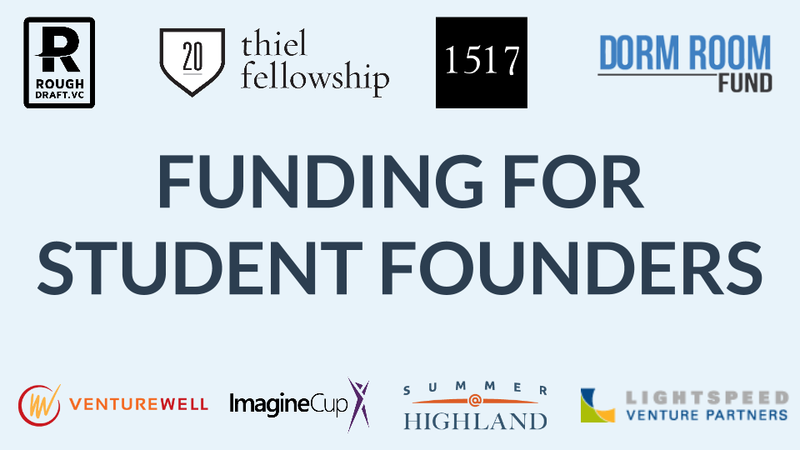 Thiel Fellowship — $100,000 for no equity. Must be under the age of 23 and commit to working on your project full-time for 2 years. Microsoft Imagine Cup — If your product is built using Windows, a Windows Phone, or Windows Azure, you can compete in this national competition which awards $50,000 each to 3 teams. Founders Microgrants — Up to $500 in no equity funding to build your product. iVenture Accelerator — $10,000/team accepted into the accelerator for no equity. Teams will work on their idea full-time over the summer and then part-time over the school year. Cozad New Venture Competition — Startups on campus compete for over $150,000 in monetary and in-kind prizes. NSF I-Corps — $3,000 for accepted teams to be used primarily for customer development and market research. Innovation Certificate Stipends — Stipends of varying amounts available to students in the iFoundry/TEC Innovation Certificate. Let’s talk about the inception, the grind, and the celebration.